If you're looking for a small, unobtrusive air purifier to help cleanse the air in your home, look no further. The Blueair 203 captures 99.97% of airborne mold spores, pollen, dust, pet dander, bacteria, and other particles down to 0.1 micron in size from the air it draws in. This compact air purifier uses HEPASilent filtration technology, which combines the best available electrostatic and mechanical filter technology for fast and whisper-quiet clean air delivery. This design makes the 203 an ideal model for bedrooms, guest rooms, closets, and other small spaces up to 200 square feet (10x20') in size. eVacuumStore.com's price for the Blueair 203 air purifier includes free shipping! 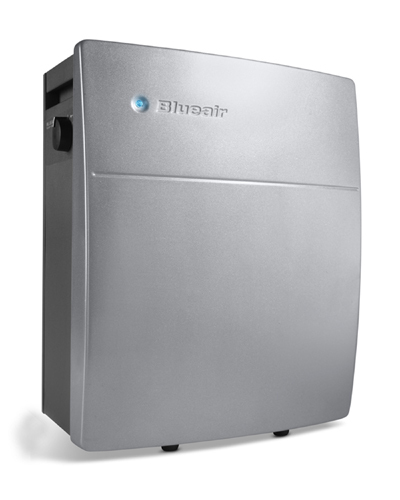 For more information about this or any of the other Blueair air purifiers we carry, please call (866) 972-8227. HEPASilent filtration technology combines electrostatic and ionization technology which is 99.97% effective at capturing particles the size of 0.1 micron. Optional Stop Smoke Filter: used to remove smoke and odors. Easy Maintenance: simply open the side, slide out the used filters and slide in the replacements. Environmentally Safe Filter: Used filters are 100% recyclable and do not release toxins.